The U.S. Census population schedule for Precinct 12, Tampa, Ward 1 in 1940. Individuals are identified by name, titles and terms, gender, age, marital status, race, relationship to head of household, birthplace, birth year, the last place of residence, and occupation. A notable resident listed in this record was Lieutenant Dean N. Post, Jr. (1921-1944). Lt. Post was a pilot who served in the U.S. Army during World World II with the 357th Fighter Group of the 264th Fighter Squadron. His airplane crashed in Martimpré, France, on May 27, 1944, and was executed by German authorities after being hidden by French citizens in Gérardmer. Lt. Post is buried at Epinal American Cemetery and Memorial in Dinozé, France. 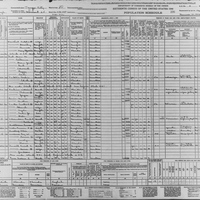 Digital reproduction of original census record by Bernice U. McDowell, April 15, 1940: National Archives and Records Administration, Washington, D.C. 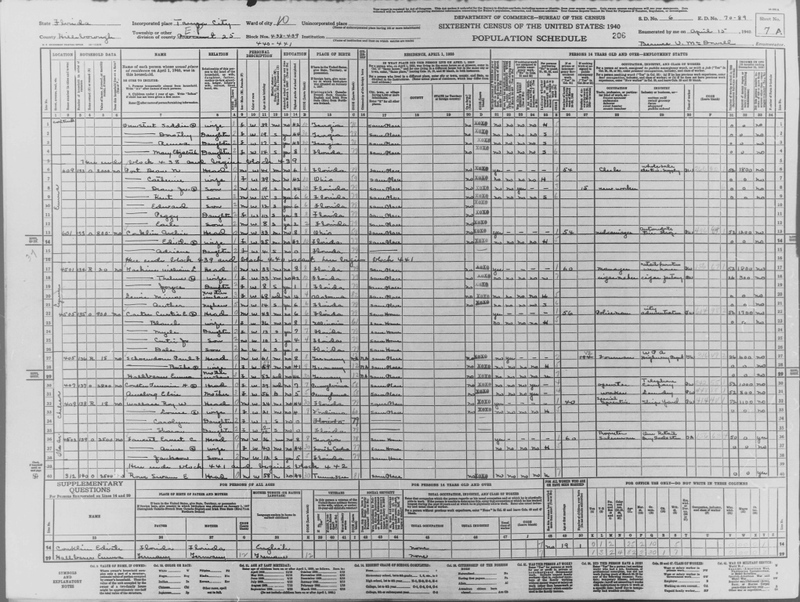 Original census record by Bernice U. McDowell, April 15, 1940: National Archives and Records Administration, Washington, D.C. Originally created by Bernice U. McDowell and published by the Bureau of the Census. McDowell, Bernice U.. “Sixteenth Census Population Schedule for Election Precinct 25, Tampa, Ward 10.” RICHES of Central Florida accessed April 25, 2019, https://richesmi.cah.ucf.edu/omeka/items/show/6888.